The Dr. Dolittle Project of Marquette University, in Milwaukee, Wisconsin, is working to apply speech technology to animal vocalizations so that certain patterns of animal speech that are similar to human speech could be identified and, if possible, interpreted. Using the Hidden Markov Model, a mathematical model developed in the 1960s for the military, the project aims to recognize and analyze such similar patterns. The Hidden Markov Model, a mathematical description of a set of data, is also used in medical imaging and DNA comparison. 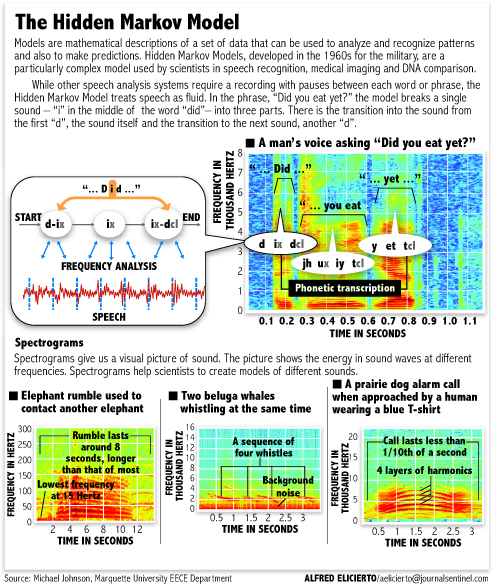 While other speech analysis systems require a recording with pauses between each word and phrase, the Hidden Markov Model treats speech as fluid. For example, the phrase “Did you eat yet?”, the model breaks a a single sound — i in the middle of the word “did” — into three parts. There is the transition into the sound from the first d, the sound itself, and the transition to the next sound, another d.
Graphic by Alfred Elicierto, published in the Milwaukee Journal Sentinel, 2007.
posts at this Web site are genuinely nice. I like your intriguing post. Topnotch information. I hope you produce more. I will carry on subscribing.